If you want to walk your dog, the KONG HandiPOD Clean Dispenser is the perfect tool! The HandiPOD combines a poop bag dispenser with an essential antibacterial hand gel. The biodegradable poop bags that come with the HandiPOD are high-quality and have handles. The HandiPOD Clean Dispenser from KONG is an essential accessory for walking your dog! The compact HandiPOD combines a poop bag dispenser with a handy disinfectant hand gel. That is great when you have an accident with poop bags or drool-covered tennis balls! The hand gel effectively removes germs and makes your hands clean and fresh. The poop bags are biodegradable, high-quality and have handles. The HandiPOD is also available as a mini variant. Are you nearly out of hand gel or poop bags? Find the refill packs here: KONG HandiPOD Clean Refill (poop bags and hand gel) or KONG HandiPOD Pick Up Bag Refills (poop bags only). The HandiPOD combines a poop bag dispenser with a handy antibacterial hand gel. A mini variant is available for small to medium-sized dogs. 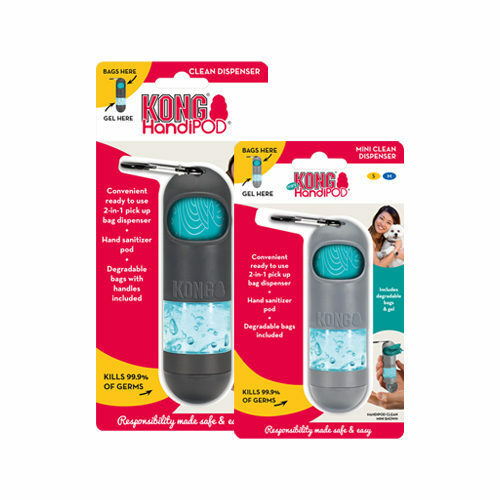 Have you used KONG HandiPOD Clean Dispenser before? Let us know what you think about this product.